The Pearson's: Drum roll Please! Yay for 1 more boy! At least you know how to deal with them! :) I hope the appt. went well and that everything looked great-including his legs! Did you find out if you were further along than you thought? Congrats! Awe...too bad you didn't get the girlie you wanted. But you make cute boys so we'll have to see if he is completely different from the other 2 or if he looks like one of them hehe :). I blame Steve hehe...Tell him hello for me by the way. CONGRATS!!! That just means you'll have to keep trying! 3 boys! I'll definitely keep you in my prayers ;)I wanna see belly pictures! and I love Bennett! You should totally do that name! Ok I was SO praying for you that you'd have a girl! 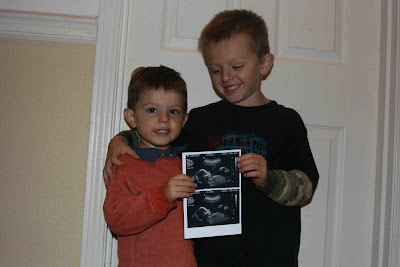 But yes, the three boys will have a blast together and keep you busy =) 3 boys and 1 girl will be cute too though! Guess you'll have to keep going! Haha! Unbelievably awesome!! Are you willing to keep trying until you get a girl? :) I'm impressed that you're already narrowing down the names! Congrats!! I should have worn you yesturday. I knew you were having a boy because everyone that I know that is due from the months of 0ct-Mar are due with BOYS. I was hoping you'd turn the page on this trend but alas, it's a boy. I wish you the best and we can swap kids anyday if you want to have some girly time! Congrats on the boy,that is awesome. This just means you have to try again for a girl! I bet those boys are so excited to have a brother. I know how bad you wanted a girl, but it just means that someone upstairs must think you are pretty dang good at raising boys! :) I am sure He will send you a girl after He feels you have reached the boy quota. Congrats! :) We will hope for a girl next time! Hey Keri! Congrats on the new baby boy! It was good to find you on here... what a beautiful family!